A couple of weeks ago I saw this message from our friend Podge that the Café Trappisten was about to close for an unknown timespan. 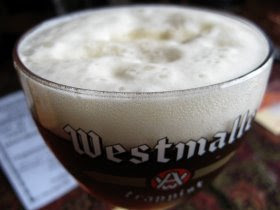 The Trappisten is the official brewery tap for Westmalle, not far east of Antwerp city. 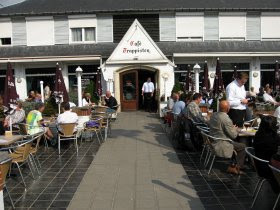 That café is as close as you'll get to the source without taking vows, normally. Not knowing how long it would be closed – and still stinging from not visiting the Hopduvel one last time – drinking buddy Matt and I went to check it out. Glad we did. The sunny and sprawling terrace was inviting, but we went for the inside portion whose days were numbered. We thoroughly enjoyed our Trip-Trap – a 50/50 blend of the Dubbel and Tripel. Go on, try it at home. It's pretty much what you'd expect: tastes like a 50/50 blend of the Dubbel and Tripel. No, there is no magical gestalt there. No powerful Trappist super-robot-beer greater than the sum of its parts. Just two excellent ales that remain excellent when mixed together. Meanwhile the snack menu had kip and also kop but no kip-kap. Thus I fell short of my dream to have kip-kap with my Trip-Trap. All part of my theory that rhyming foods taste better. The old café was really a nice place. It was large yet lived-in and cozy. The Germans would note its Gemütlichkeit and start claiming tables for their Stammtisch. It takes years and years to build up that sort of character. I'm still scratching my head wondering why they decided to scrap it. Maybe we'll find out very soon. The new café opens to the public this Saturday, October 25. Plus there is a sort of reopening party starting at 4 p.m. this Thursday. All are welcome, I was told. Then, after investigating this newfangled place, we can decide whether to like it or lament the old one. Or, more likely, some of both.